For the 2003 game, see The Hobbit (2003 video game). The Hobbit is an illustrated text adventure computer game released in 1982 for the ZX Spectrum home computer and based on the book The Hobbit, by J. R. R. Tolkien. It was developed at Beam Software by Philip Mitchell and Dr. Veronika Megler and published by Melbourne House. It was later converted to most home computers available at the time including the Commodore 64, BBC Micro and Oric computers. By arrangement with the book publishers, a copy of the book was included with each game sold. The parser was very advanced for the time and used a subset of English called Inglish. When it was released most adventure games used simple verb-noun parsers (allowing for simple phrases like 'get lamp'), but Inglish allowed one to type advanced sentences such as "ask Gandalf about the curious map then take sword and kill troll with it". The parser was complex and intuitive, introducing pronouns, adverbs ("viciously attack the goblin"), punctuation and prepositions and allowing the player to interact with the game world in ways not previously possible. Many locations are illustrated by an image, based on originals designed by Kent Rees. On the tape version, to save space, each image was stored in a compressed format by storing outline information and then flood filling the enclosed areas on the screen. The slow CPU speed meant that it would take up to several seconds for each scene to draw. The disk-based versions of the game used pre-rendered, higher-quality images. The game has an innovative text-based physics system, developed by Veronika Megler. Objects, including the characters in the game, have a calculated size, weight, and solidity. Objects can be placed inside other objects, attached together with rope and damaged or broken. If the main character is sitting in a barrel and this barrel is then picked up and thrown through a trapdoor, the player would go through. Unlike other works of interactive fiction, the game is also in real time, insofar as a period of idleness causes the "WAIT" command to be automatically invoked and the possibility of events occurring as a result. This can be suppressed by entering the "PAUSE" command, which stops all events until a key is pressed. The game has a cast of non-player characters (NPCs) entirely independent of the player and bound to precisely the same game rules. They have loyalties, strengths, and personalities that affect their behaviour and cannot always be predicted. The character of Gandalf, for example, would roam freely around the game world (some fifty locations), picking up objects, getting into fights and being captured. The volatility of the characters, coupled with the rich physics and impossible-to-predict fighting system, enabled the game to be played in many different ways, though this would also lead to problems (such as an important character being killed early on). There are numerous possible solutions and with hindsight, the game might be regarded as one of the first examples of emergent gameplay. This also resulted, however, in many bugs; for example, during development Megler found that the animal NPCs killed each other before the player arrived. The game's documentation warned that "Due to the immense size and complexity of this game it is impossible to guarantee that it will ever be completely error-free". Melbourne House issued a version 1.1 with some fixes, but with another bug that resulted in the game being unwinnable, forcing it to release version 1.2, and the company never fixed all bugs. 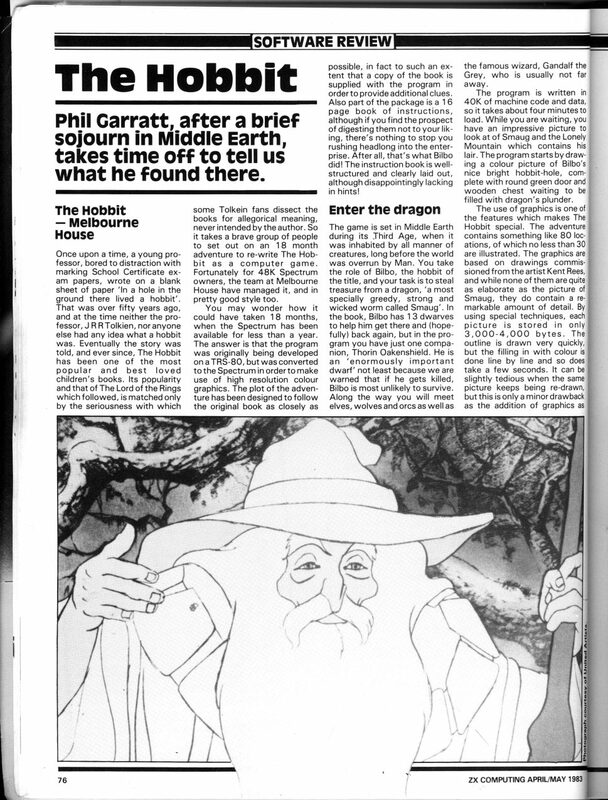 Info in 1985 rated The Hobbit on the Commodore 64 three-plus stars out of five, stating that the graphics were "pleasant but no show-stoppers", and that the game's parser and puzzles were "typical of most adventures today". The magazine concluded that "Tolkien fans will most likely be pleased with this title". 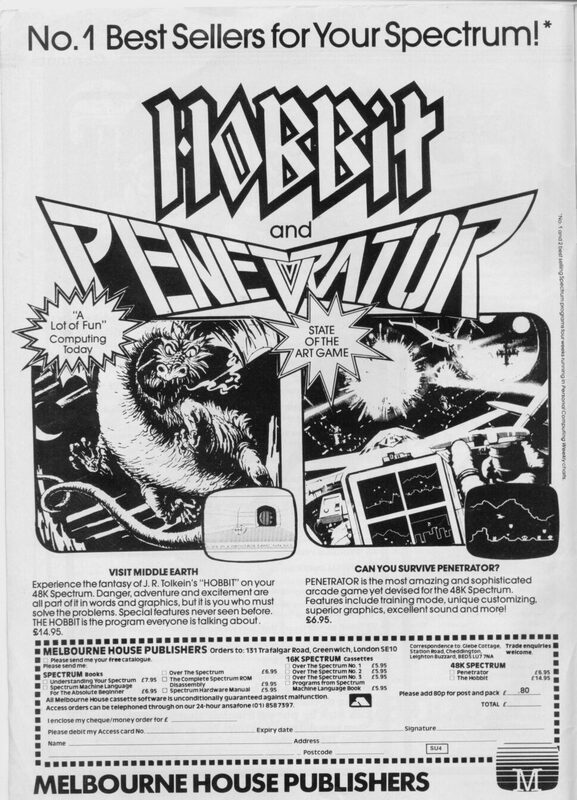 The Hobbit was a bestseller in the UK on the ZX Spectrum in 1983 and both the C64 and BBC the following year. 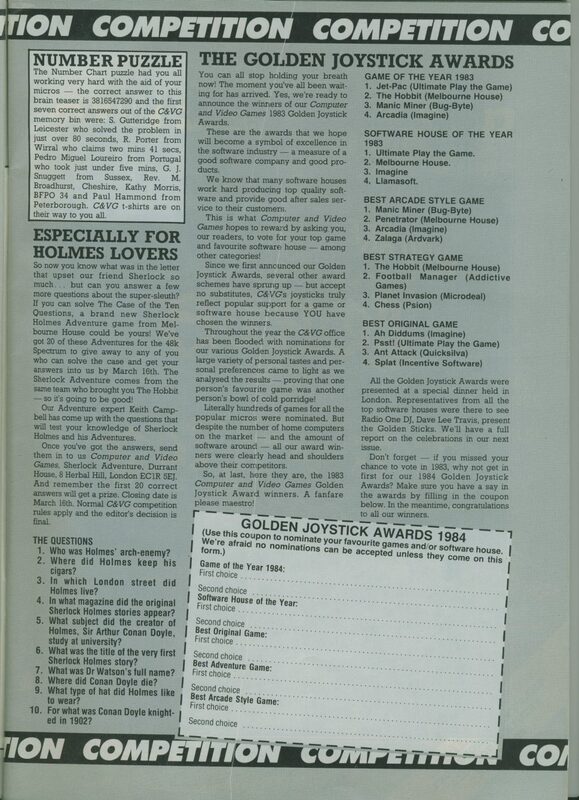 The game won the 1983 Golden Joystick Award for best strategy game. The game was also a huge commercial success, selling over 100,000 copies in its first two years at a retail price of £14.95. 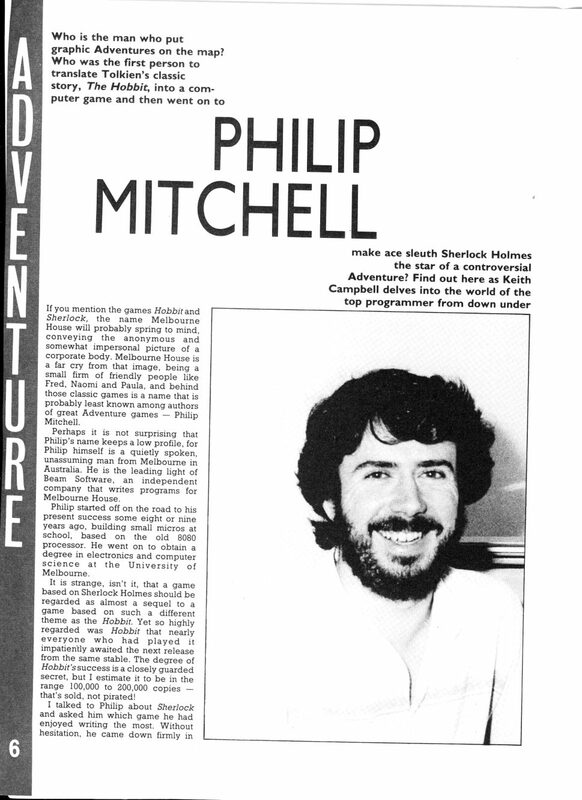 There are no records of sales figures but in an article from March 1985 it was estimated in the range of 100,000 to 200,000 and a figure of 500,000 copies is possible, making it an "excellent candidate for the bestselling text adventure of all time, challenged, if at all, only by Infocom’s Zork I". The use of images on many of the locations as opposed to mostly text-only adventure games of the time, the flexibility of the Inglish parser, the innovative independence of the non-player characters, the popularity of Tolkien's work, all attributed to the game's phenomenal success. To help players a book called "A guide to playing The Hobbit" by David Elkan was published in 1984. Developer Beam Software followed up The Hobbit with 1985's Lord of the Rings: Game One, 1987's Shadows of Mordor: Game Two of Lord of the Rings, and 1989's The Crack of Doom. They would also reuse Inglish in "Sherlock". In 1986 a parody of the game was released by CRL, The Boggit. A phrase from the game which has entered popular culture is "Thorin sits down and starts singing about gold." Also, the game is mentioned in Nick Montfort's, Twisty Little Passages, a book exploring the history and form of the interactive fiction genre. Discworld Noir references The Hobbit: when the protagonist, Lewton, discovers that someone concealed themselves in a wine barrel, he wonders why that brings to mind the phrases "You wait – time passes" and "Thorin sits down and starts singing about gold." ^ Simon Sharwood (2012-11-18). "Author of 80's classic The Hobbit didn't know game was a hit". The Register. Retrieved 2012-11-18. ^ "Personal Computer Games" (3). February 1984: 4. Retrieved 3 May 2016. ^ a b c Maher, Jimmy (2012-11-16). "The Hobbit". The Digital Antiquarian. Retrieved 10 October 2014. ^ "The Hobbit and his Lady". L'avventura è l'avventura. April 2002. Retrieved 10 October 2014. ^ "Melbourne House Advertisement". Sinclair User (13): 4. April 1983. Retrieved 3 May 2016. ^ Mike Gerrard: Adventuring into an Unknown World. 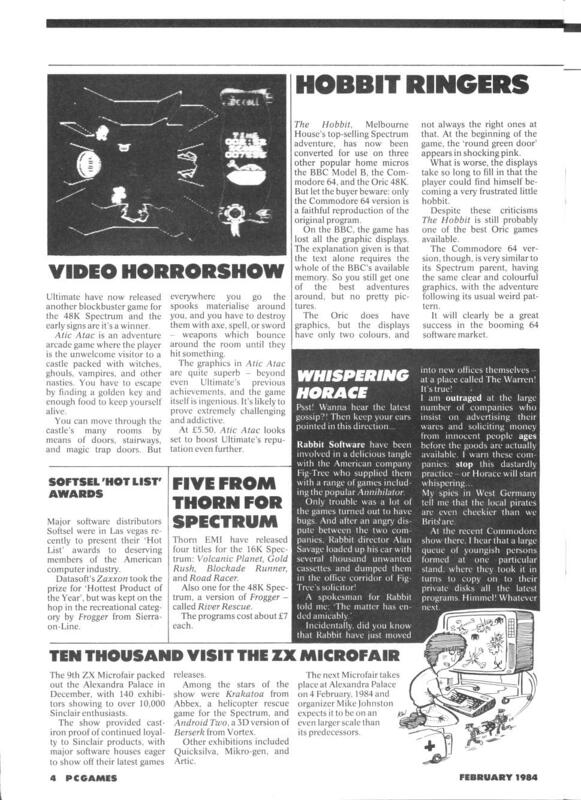 In: The Guardian, 1984-08-30, section Micro Guardian/Futures, page 13. ^ Campbell, Stuart (December 1991). 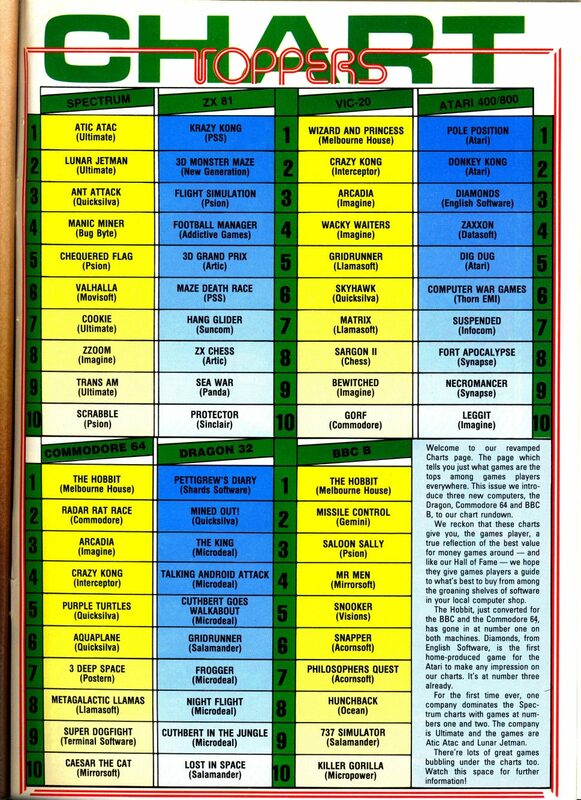 "Top 100 Speccy Games". Your Sinclair (72): 28.